The online course that shows you how to stop difficult people in their tracks. Hi. I'm Eleanor Shakiba, your course presenter. If you want to master the art of verbal self-defense, you’re in the right place. Difficult People Made Easy shows you how to stay calm and speak up in tough conversations. Yes! It’s possible to handle difficult behaviour confidently and constructively. Learn to recognise and respond to the behaviours and games ‘difficult people’ use. Maintain your personal power when dealing with aggressive behaviours - such as shouting, criticising or using abusive language patterns. Get tips for handling ‘victim’ behaviours – such as chronic complaining, emotional blackmail or telling poor me stories. Respond to passive-aggressive behaviours (such as gossiping, going slow or buck-passing) without getting roped into power games. Use 3 rules of verbal self-defense to handle demanding, critical, complaining, or manipulative people. Spot key games played by different types of difficult people, so you can stop them in their tracks . Take back your power, so you can handle difficult behaviour calmly, confidently and professionally. Learn how to use key skills of assertive communication to handle the difficult people in your life. Respond to aggressive behaviours such as shouting, criticising, demanding or refusing to listen. Get tips for dealing with problematic passive behaviours such as playing victim, failing to make decisions or take initiative, staying quiet in meetings and failing to problem-solve. Use a step-by-step process for handling passive-aggressive tactics such as gossiping, backstabbing and sarcasm. Here’s what’s covered in each lesson. Lesson 1.3 rules of verbal self defense. Difficult people invade your boundaries play psychological games. In doing so, they use predictable verbal attack patterns. Learn to respond to verbal attacks calmly and assertively, by using 3 critical rules of verbal self-defense. Lesson 2. Spot their game. Handling difficult people means interrupting their game-playing. Learn to recognise the games commonly used by people in fight, flight and spite mode. This sets you up to address the game successfully and alter the difficult behaviour as quickly as possible. Lesson 3. Step into your power. Dealing with difficult behaviour can erode your confidence or make you feel out of control. However, it is possible to stay cool, calm and collected. Learn how to manage your thinking, shift out of negative emotional states and clearly define where you want the conversation to go next. Never allow a difficult person to control your feelings again! Lesson 4. Handle aggression without giving in. Discover how to manage pushy, demanding or aggressive communication tactics. Find out what’s really going on for someone in fight mode. Learn to de-escalate conflict and get the conversation moving in a positive direction, by using a simple four step process. Use your bonus mind programming session Say No and Mean It to increase your ability to set boundaries. Lesson 5. Manage passive behaviour without rescuing. Avoid getting drawn into the ‘rescuer’ game when dealing with submissive, or passive, people. Recognise the signs that someone is facing you into the rescuer role and set boundaries. Help people with victim mindsets solve their own problems, rather than taking responsibility out of their hands. Lesson 6. Set boundaries with passive-aggressive people. Keep your cool when working with toxic or manipulative people who use passive-aggressive tactics. Use a simple four step process when responding to sarcasm, nasty jokes and pointed remarks. Set firm limits when dealing with the covert hostility that drives spite based behaviour. Your course pack includes all this! Welcome! My name is Eleanor. I'm a master trainer and success coach, based in Sydney. My passion is helping smart professionals - like you - to excel. I teach savvy people how to develop positive mindsets, powerful communication and purposeful action. These are all skills you need when dealing with difficult people. I've already taught 50,000 people skills for career success. In 2017, I set up Success Factor Academy to achieve my goal of training 100,000 people by 2020. I’d love to work with you next. Difficult People Made Easy is the online version of my live workshop Dealing with Difficult People. It brings you strategies you can use to set boundaries and manage challenging behaviours right now. It’s full of practical techniques I’ve developed by working with thousands of successful communicators. Where have I worked with these people? At the University of Sydney (where I was a staff development trainer for 7 years), in major corporations across Australia, at the Centre for Continuing Education in Sydney and in the Centre for Community Welfare Training. These are only a few examples of the high profile training organisations I work for. I love to work with ambitious, success-focused people. I'd love to work with YOU next. Learn how with this amazing sneak peek offer. Get your FREE copy of my Behaviour Analyser Report guide. Fill in a quick questionnaire and get an immediate assessment and report on how to handle the difficult person in YOUR life. 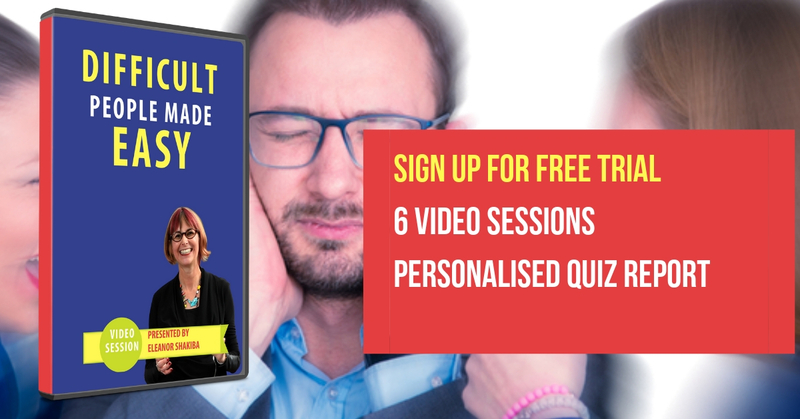 Plus you’ll get 6 free training videos which explain how you can communicate with confidence and power - even in challenging situations. Sign up now.